As I continue my now year-old journey as a Mac user, I’ve blogged about a few tips that I’ve stumbled upon, such as how to drag text onto your desktop and change it into a text note, how to reveal the dock and menu bar when using full screen apps in Lion, and how to add folders to the Finder sidebar. Many of these tips are probably “Duh!” moments to seasoned Mac users, but for those of us who come from the Windows world, they aren’t so obvious. 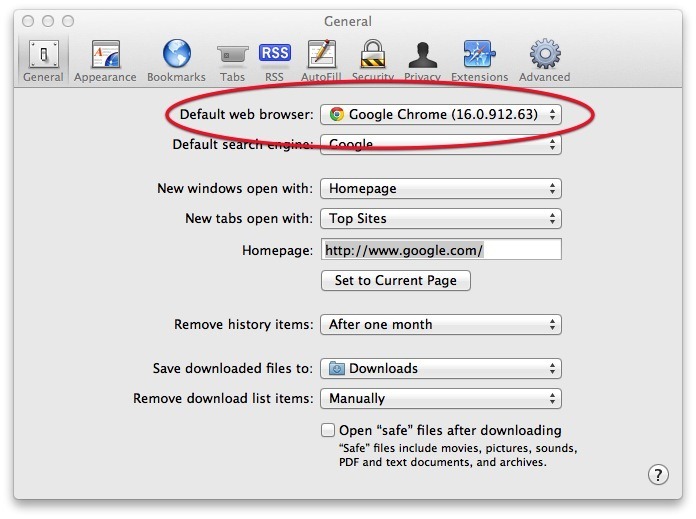 It’s time to add another simple but important one to the list – how to change your Mac’s default email client and web browser. Windows users are accustomed to going to a centralized place to set default programs. 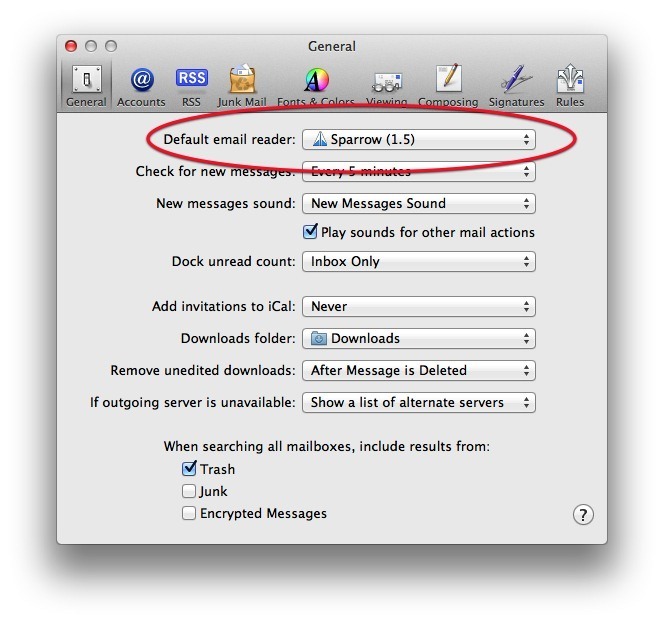 On a Mac, to set your default email client and web browser, it’s a bit different. Instead of a system setting pane, you go to Safari settings and the Mail app settings (Safari > Preferences, or Mail > Preferences from your menu bar). In each preference pane, the setting to change the default app can be found in the “General” tab. The ability to change the app was important to me. While I find the Mail app to be decent (Sparrow is my favorite, though), I ‘ve decided that Safari needs to be taken out behind the house and shot. I tried to use it as my default browser for about a month, and hated it the entire time. I now use Chrome on my iMac, but I use Firefox on my Macbook Air, due largely to the ability to customize the Firefox interface for a smaller screen. On my Air, I’ve scrunched everything into a compact area. What browser and mail apps do you use? – standard Mail client for mail. – again, standard Mail for Mail. I don’t have any control over this – company has 100K+ machines and enforces standard software to minimize support issues. On my Palm Pre, I use the aptly named “Email” and “Web” apps. I’ll pretty much use any email client or browser that’s put in from of me. Any of today’s option are far better than what I started with (some Unix-based client for mail and Mosaic 1 for web). At least they’re not using IE6 at work. My wife worked for one of the bigger companies in the world a couple years ago, and their sales force was still using an app that required IE6. Even back then, that was a big no-no. We were on IE6 until maybe 18 months ago? I don’t think it was completely out of the box, though. We tend to customize a lot of software, and have the leverage to get companies to work with us. On the other hand, finding vendor software the scales to our needs can be a trick at times (in addition to the 100K internal machines, we have a number of external interfaces and a customer base numbering in the tens of millions). My wife’s situation was similar – they had some piece of software that hooked into IE6 somehow. It was still scary, as there were warnings all over the web about the exploits in IE6. Evan – great post! I’m feeling this was “inspired” by the chat on G+ yesterday! :) Keep up the great Mac tips – I need them!! Oh, PS: I just purchased & downloaded Sparrow! Thanks for that one, too, Evan! :) LOL!! Sparrow is great. I still use it every day as my main personal mail client. Actually, Dan, chalk it up more to a case of great minds thinking alike. For posts that aren’t time-sensitive, like this one, I typically get them queued up 3-7 days in advance. I might have missed this on G+, but did you just get your first Mac? Agreed on Sparrow. Great piece of software. I’m currently writing a post about my top App Store apps, Andreas, and Sparrow will be right near the top of the list. Evan: wouldn’t agree more! Great minds do indeed think alike!! Yes, I finally, finally acquired a MacBook Pro for my consulting/ebook/blog business and personal use. Wow, what a difference!! I have a post up on G+ asking folks what Mac apps they use most. Let me know!! Dan, is that the browser post you have up? I saw that one, but not one about apps in general. Evan – here’s the link: https://plus.google.com/100600034652261299279/posts/T7cHGFk3LmC. Hadn’t heard of that one, Tony. Looks pretty cool.